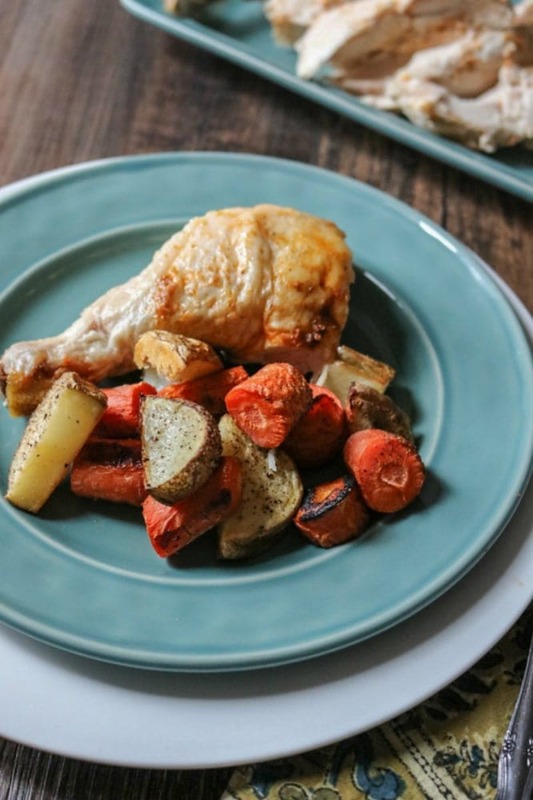 Oven Roasted Homemade Rotisserie Chicken: Skip the preservatives and additives found in store-bought and make your own oven roasted rotisserie chicken with only 5 minutes of work!! You end up with a juicy, tender chicken that stars on its own or in any dish that calls for cooked chicken. ME! ME!! And my whole family! The problem? Take a look at the list of ingredients and you will be disgusted. MSG, corn syrup solids, carrageen, hydrogenated oil, and on and on! But leftover Rotisserie Chicken is so tasty, juicy, convenient, and star in so many fabulous dishes–hello Chicken Enchiladas, Creamy Parmesan Rotini with chicken, and Creamy, Cheesy Chicken and Rice! That’s why a delicious homemade Rotisserie Chicken is just the recipe you need to keep in your arsenal. You can make a rotisserie chicken in the oven with only 5 minutes of prep and you will never be tempted to buy a store-bought Chicken Rotisserie again. The best part you don’t even need anything fancy–just your oven, a few dried spices and a fresh chicken. Speaking of fancy equipment, I was once given a rotisserie grill. I was so excited, even though the thing weighed about as much as me and took up more counter space than any other appliance. I tried that thing out instantly and was bummed. I tried again and again–and nothing quite worked the way I envisioned. Then I tried my oven low and slow–and MAGIC!!! Don’t be fooled by all those fancy tools–most are worthless!!! But back to the oven roasted chicken. 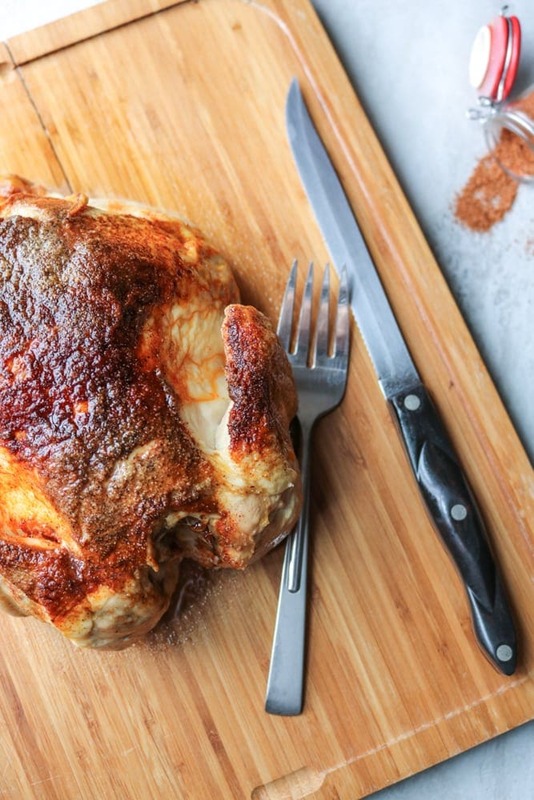 How do you make Homemade Rotisserie Chicken? Make a dry rub by combining a few spices, brush the chicken with oil, and sprinkle on the spices. Rub the spices in–but if that grosses you out, just sprinkle them on liberally. The secret to success when making your own Rotisserie Chicken is to roast the chicken low and slow. Place in a 300 degree oven for 2 hours to 3 hours (depends on size of chicken) or until meat thermometer inserted into thigh reads 165 degrees. Think about doing this on a Sunday afternoon–you can make several chickens at a time, eat one for Sunday Supper and then have the meat from another chicken ready to go for quick weeknight dinners. Be sure to use a digital thermometer inserted into the Chicken thigh to ensure proper cooking. Both an under cooked and overcooked Roasted Chicken, is NOT a good thing. Muti-task and plan ahead and make more than 1 Rotisserie Chicken at a time. Extra Chicken Meat is a great thing to have on hand to make dishes like Creamy Chicken and Rice, Amish Chicken, Tex-Mex Chicken Casserole, or Healthy Chicken Salad. Save the bones from your Oven Roasted chicken to make Homemade Chicken Stock. If you have an Instant Pot, check out how to make Instant Pot Rotisserie Chicken. How to cook Rotisserie Chicken in your oven. Combine ingredients for the dry rub. Brush the chicken with oil or butter and rub the dry rub into the chicken. Place whole chicken, breast side down on rack in roasting pan. Pour in 1 cup water into roasting pan bottom. Bake until thermometer inserted into thigh reads 165 degrees--about 2 1/2 hours. Let rest 10 minutes and serve or save meat to shred for dishes that call for cooked chicken. Alternatively, you can place seasoned chicken directly in roasting pan (no rack needed). If this is the case, cook breast side up and do NOT add liquid to pan. This sounds so savory, I am going to need to try this! Great post Kristen. Low and slow. I think I got it! 🙂 Your chicken looks fabulous and I’m thrilled to skip all the unpronounceable ingredients. THANK YOU! Low and slow is key. I cannot wait to try this! We eat rotisserie chicken a lot. I’ve never made it myself but I love the taste. And you can use it for so many things. I shop at Aldis a lot and they have whole chickens for just $5 so I have not reason not to make my own. I’m going to try this on the weekend. You must try Denise! And ALDI is the best! We LOVE rotisserie chicken! Who would’ve thought you could do it at home. yum! You sure can Des, and easier than you would guess too! We have roast chicken fairly regularly but I’ve never tried the low and slow way, must give it a try! And like the seasoning. Oh yes, try the low and slow–it produces such a different flavor! Wow does this look great! I love roast chicken for dinner and I love making chicken soup and chicken salad with the leftovers! Delicious! This is just perfect for you then! This chicken is perfection! Can’t wait to try it!! This chicken looks so moist and delicious. Love it! It is so moist–totally a winner! I admittedly LOVE store bought rotisserie chicken! That said, I do buy the organic one and spend way more money than if I just made my own. The convenience can’t be beat sometimes but for all those other times, I need to try this out! I hope you do this when you have planned ahead. Otherwise, you are lucky to find organic ones–the only time I have ever seen that was over an hour from my house! I do occasionally buy a rotisserie chicken here and there, but usually we roast our own. It’s actually my husband’s job most of the time! He makes a great roasted chicken. I will share your recipe with him too! I love a roasted chicken as an easy weekend dinner. Thanks for sharing this method! Rotisserie chicken is one of our go-to meals every week. I really should make them myself, because your recipe is so simple and looks delicious! I love all of the wonderful recipes you can make using a roasted chicken, too! I hope you do give this a try–it is really easy Ashlyn! I love this recipe! I just love the flavor of rotisserie chicken, but like you, want to control what we eat. Then this is just for you Julie! Thank you so much Helen! And yes this recipe is easy! Thanks for sharing on the “Whats for Dinner” linky party! Was going to attempt Ina Garten’s roast chicken recipe, but I don’t have fresh thyme here in December. So I’ll be making yours – I have everything on hand already and it looks so easy! Enjoy Kristen. This is super easy. Linda, this makes me so happy! I am so glad you enjoyed it! Looks great! Do you cook the chicken in a roasting pan with or without a lid? Thanks Chris–without a lid so the skin can crisp up! Great thanks! I’m making tonight 🙂 in the picture above you show roasted vegetables, would you put them in at the same time or 1/2 way through? Yay!! Well if you cut your veggies in large chunks–like 2-3 inches or want to serve whole potoates, throw in at same time since this is roasted low and slow. If you like your veggies to be more crisp tender, put in at the half way mark. Do you like to roast your bird Breast side down for most of the cooking time, then turn the bird over for 30 mins? Usually the white meat will be moist with golden brown skin. I do this for my turkey every Thanksgiving???? You better believe it! That is the best way to roast any bird. It was amazing.oven roasted rotisserie chicken is honestly one of my favouritest things in the whole entire world and I honestly did know it could be make like this.. I thought it was just. Ooo! I wish I could share the picture of the rotisserie chickeni made this afternoon!! So golden and crispy. 🤤 I’m having knee surgery this Thursday so I figured today was as good a day as any to do some meal prep for this week. I had 3 chickens and one went in the instant pot, the other 2 went side by side in my roasting pan for 2+ hours. I can’t wait to use the shredded meat in some of the recipes you shared! Can I use minced garlic for this recipe? Hi Marea! This is one of those times where dry garlic powder is superior to minced garlic. The minced garlic would burn on the skin of the chicken–since this is a dry rub. If you don’t have garlic powder, just omit it from this recipe. This was so delicious. My oldest son is legit on his 6th or 7th serving. I followed the instructions exactly as you wrote them, and it was great! My crew is happy tonight! And I feel like a boss. Have you made this with only breasts. If so, how long do you cook it for. Hi Lucia! Here are my instructions for IP Chicken Breasts. I would use the homemade seasoning and then cook according to these directions (still place chicken on rack and use water or stock underneath chicken). However, if you are cooking Bone-In, Skin-On Chicken Breasts, you would need to cook for 4-5 minutes more per pound. Hope that helps. Enjoy! Sooo I was ready to do this IP version and yep-my chicken didn’t fit 🤣 oven here I come!! I have been there myself. It is helpful to have both recipes. Enjoy your chicken. This was perfect! Only sub was an herb blend instead of thyme, as my husband and I aren’t big fans of it. Otherwise followed the recipe exactly and our chicken came out incredible! Our company was very impressed. Highly recommend! Kristen, this looks delicious, want to try this weekend for the family. After reading some of these comments, just wanted to confirm – cook breast down, directly on rack, and don’t turn during the 2-3 hours? Also, don’t put in pan, but place pan beneath with chicken stock in it? Hi Kevin, I am going to update to be sure directions are clear. The BEST method is to roast chicken, breast side down, on rack over larger roasting pan (that has 1 cup of water in it). Or you can just place chicken on baking sheet–this time I would cook breast side up, so meat does not stick to bottom of baking pan, just add rub and roast. (No water needed). Sorry for the confusion. Fantastic chicken! I did as you recommended and it turned out perfect. Flavorful and very moist. Thank you!! Wonderful Kevin! Thanks for letting me know . Hello! I just started your IP chicken and am now off to make your Homemade Oven Rotisserie Chicken. I think your nutrition infor must be wrong! There is no way that this has 21g of fat! Hi Brianna! I hope you enjoy both chicken 🙂 Unfortunately, it is hard to get the nutrition facts accurate. A 4 ounces of chicken with skin is about 11 grams of fat. Sorry about that! My nutrition calculator was not accounting for bones I believe. Hi Beth! Since you are just using the pieces of a chicken, I would check the temperature after 1 hour and 30 minutes. You want it to reach 165 degrees, but you will need a lot less time than the full 2 1/2 hours. I hope you enjoy! Hi Ann, first of all I am so glad you enjoyed this chicken 🙂 If you would like your chicken breast to brown, you can roast skin side up–by roasting upside down the fat and juice help to keep the chicken breasts juicy and flavorful though. I made six of these rotisserie chickens in two ovens for a family gathering. I used 5 lb chickens from Sam’s Club. The recipe was simple to follow and I had all of the ingredients on hand. The entire family agreed that the chicken was the best they have had. It is much better freshly baked and served than purchasing one at the store that has been sitting there for hours. The seasoning was delightful, not over bearing. It was melt in your mouth deliciousness. I highly recommend that you give this recipe a try! Oh thank you for sharing your love of this recipe Sandra. I am so glad that your entire family enjoyed! This made my day! My husband LOVED this chicken. I did a 5 pound bird! I put onion and garlic in the cavity for more meat flavor and I’m making it again tonight to use in a Chicken Pie recipe with my ESL class tomorrow! This is a great find. Thank you for sharing.